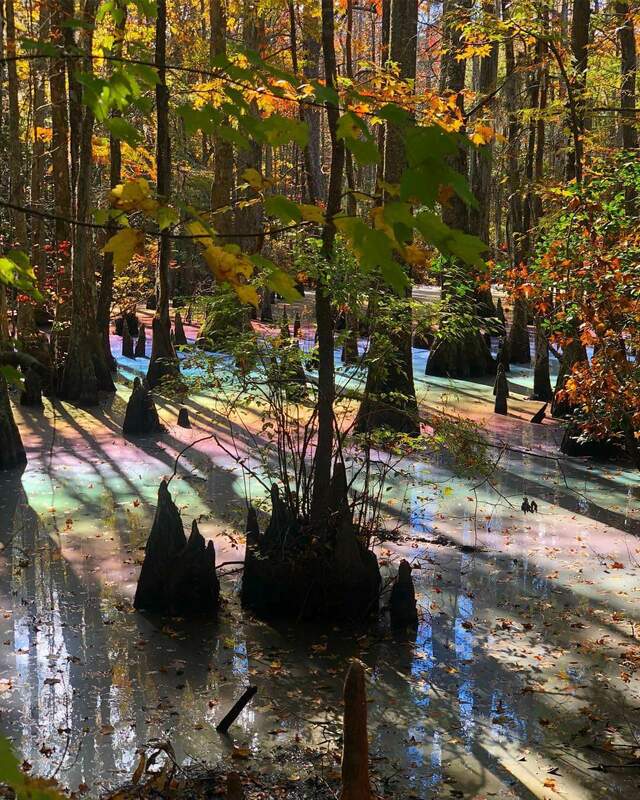 When Brent Rossen posted his girlfriend's photo of a rainbow swamp on Reddit, it received more than 120,000 upvotes in 24 hours. "Me and my girlfriend were walking in the woods the other week and saw a rainbow pool for the first time" his post read. Jeff Ripple, a former Florida swamp walk leader, told the BBC: "The rainbow sheens found as a thin film on top of pooled water in swamps and marshes are the result of natural oils released by decaying vegetation or the biological processes of anaerobic bacteria reducing iron in soil." Jeff explained that the water needs to be still for long periods in order for the rainbows to appear. "Movement by sheet flow, current or wind disturbance would destroy the fragile rainbow film," he said. He added that he normally sees the phenomenon in smaller areas. Retired engineer Michael Hussey shared his photo of a rainbow pool in Tallahassee, Florida. Michael said that he was watching the small, swampy area in his grounds at home each day as the water began showing different colours. "If it doesn't rain for a couple of weeks it continues to become more pronounced," he said. Michael said he sees it every three or four years, in mid-February. "I have seen this occur about 10 times in the 40 years I have lived here," he said. "It's beautiful to see." Another Florida swamp walk leader Sandra Friend blogged about her experience: "Over the years, I'd noticed this phenomenon in swamps along many Florida trails, as well as somewhat of a faded rainbow effect across the waters. "I finally encountered the pastel swamp rainbow effect in all its glory. 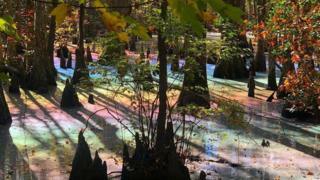 Several other photos of the phenomenon can be viewed using the hashtag #rainbowswamp on Instagram.